Liam Carey celebrates hitting the net for Beaufort. BEAUFORT WERE CROWNED the ninth Kerry winners of the AIB All-Ireland Junior club football Championship in convincing style this afternoon. 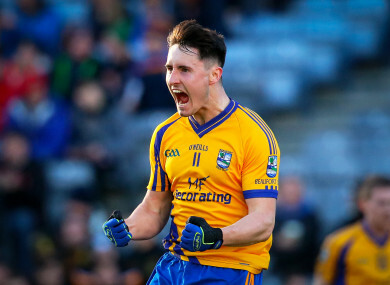 They became the fourth club from the six-club Mid Kerry district to win an All-Ireland club title as they pulverised the Easkey kick-out in the first-half to take a commanding 16-point lead at the break that would go on to become a 21-point winning margin in the end. Easkey had most of the possession in the opening exchanges but did not score until the 13th minute through team captain Eugene Mullen. Beaufort registered 1-3 in the intervening period, Ronan Ferris scoring their first goal after reacting quickest to Fergal Hallissey’s fisted effort at a point coming off the post in the eighth minute. Hallissey was the provider for the second as Ciaran Kennedy made it 2-3 to 0-1 in the 18th minute with Liam Carey becoming Beaufort’s third goal goalscorer before half-time to forge a 3-8 to 0-1 advantage. Padraig Doona made it the full set for Beaufort in terms of their forwards all scoring as Easkey had to wait until the 50th minute through a Joe McHugh free and points from Kevin Duffy and substitutes Jack Scott and Jonathon Conway added to their meagre total. Mike Breen was the main conductor of Beaufort’s win as Easkey found the Division One side in Kerry too much to handle. The victors join their neighbours Laune Rangers (senior, 1996), Milltown/Castlemaine (intermediate, 2012) and Glenbeigh/Glencar (junior, 2017) in winning All-Ireland club titles from one of the smaller districts in the Kingdom. With a personal total of 1-5, Liam Carey was awarded the official man-of-the-match award. Scorers for Beaufort: Liam Carey 1-5, Fergal Hallissey 0-5 (0-4f) Ronan Ferris and Ciaran Kennedy 1-1 each, Danny Healy 0-2, Padraig Doona, Nathan Breen, Niall O’Connor 0-1 each. Scorers for Easkey: Eugene Mullen, Joe McHugh (0-1f), Kevin Duffy, Jack Scott and Jonathon Conway 0-1 each. Email “Kerry's Beaufort crowned All-Ireland champions as Carey stars with 1-5 in Croke Park win”. Feedback on “Kerry's Beaufort crowned All-Ireland champions as Carey stars with 1-5 in Croke Park win”.